The burger: When the sign outside the front door proclaims “Home of the Greatest Burger,” that had better not be hyperbole. 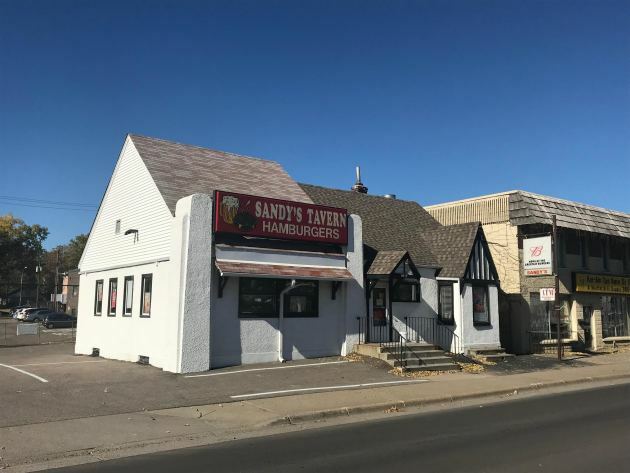 Or a case of laurels-resting, which would be understandable, because the front door in question belongs to 85-year-old Sandy’s Tavern in Richfield. The Ericksons, Debra and Jeff (“But I go by Eric because my last name is Erickson,” he said) bought the place in 1980, and while I’m clueless about the menu before their tenure, the couple has certainly captured, in all of its enduring appeal, the essence of the no-frills, tavern-style burger. They’re cooked to a routine medium (“Unless someone requests on the rare side,” he said), and once they’re inserted into a toasted bun, they fly out of the kitchen piping hot. The bun, from Franklin Street Bakery, is part of this burger’s appeal. And a big-old smear of mayonnaise is was what my California-style burger received, along with a thick tomato slice, a few crunchy lettuce leaves, a spoonful of soft (and softly sweet) cooked onions and a handful of vinegary (but institutionally semi-dreary, it must be said) pickle chips. 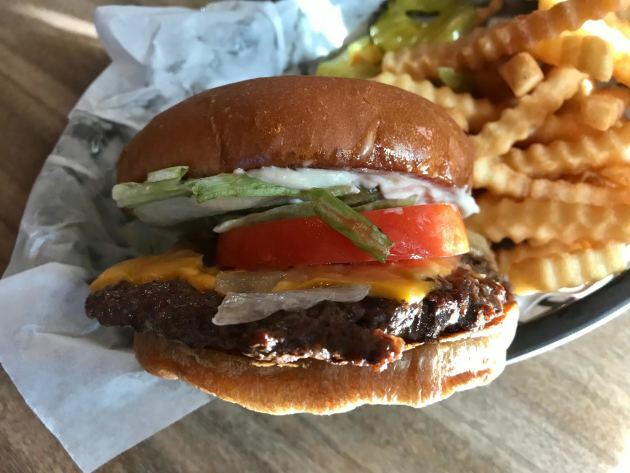 It’s kind of messy (don’t ask for a fork and knife, because there aren’t any, which maybe explains why each table is armed with a napkin dispenser), two-fisted, bargain-priced burger that pairs well with a Grain Belt. Yeah, that sign isn’t false advertising. Price: Single-patty burgers start at $5 (a double is $8.75). Add cheese for 25 cents/slice, and make it California-style for an additional 75 cents. Other add-ons (mushrooms, bacon, egg) are extra. Fries: Not included (an additional $3.50 for a half-order, pictured, and $6 for a full). They’re prepackaged crinkle cuts, fried to a notable crispiness, with fluffy interiors, and they do the job. Why crinkles? “It’s just what the customers demanded, and that’s what we gave them,” said Erickson. House specialty: Of the various burger permutations on the menu, the one that’s made the most lasting impression is the Olive Burger, a cheeseburger topped with sour cream and green olives. “Folks come from all over for it,” said Erickson. 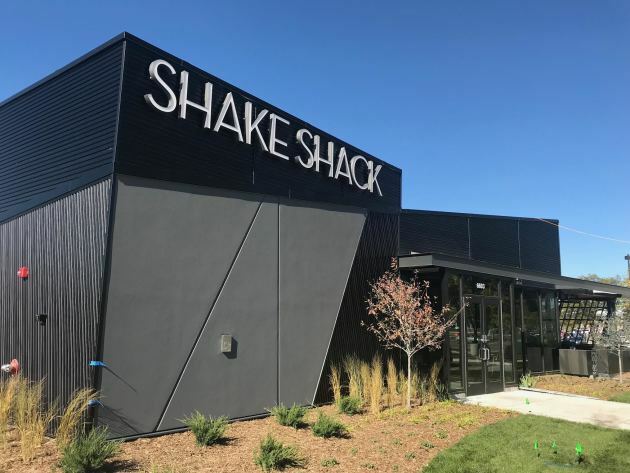 In other burger news: Meanwhile, a mile and a half to the west, it looks as if Shake Shack — the national chain turns out a memorably delicious fast-food burger — is getting closer to opening its location in the northwest corner of Southdale's parking lot, near the 66th-and-France intersection. Construction is in its last stages, and the hiring process has started. Stay tuned. Address book: 6612 Penn Av. S., Richfield, 612-869-9945. Kitchen open 11 a.m. to 11 p.m. Monday through Saturday, 11 a.m. to 10 p.m. Sunday. Cash only, and there’s an ATM on the premises.